A unique limited edition published in tribute to one of the Luftwaffe's highest scoring Aces, and greatest fighter leaders. Macky Steinhoff in action over the White Cliffs of Dover. 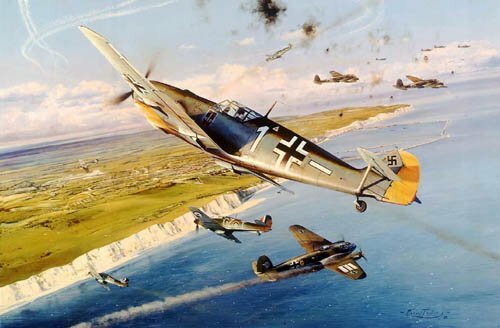 It is August, and the height of the Battle of Britain: Heinkel 111 bombers have attacked airfields and radar stations along the south coast, and a frantic dog-fight has developed as Me109s of JG-52 clash with Hurricanes of the RAF's No. 32 Squadron. Macky's Me109E, which dominates the picture, provides a magnificently detailed study of this superlative fighter, as he and his fellow Luftwaffe pilots do their best to protect the retreating Heinkels. Below is a wonderful panoramic aerial view of Dover Harbour, the legendary White Cliffs, and the carefully researched landscape showing the south-eastern tip of the British Isles as it was in 1940.